West Kennet Longbarrow is a Neolithic tomb/barrow on a chalk ridge near Silbury Hill. As part of the Avebury complex it makes for a fascinating feature. 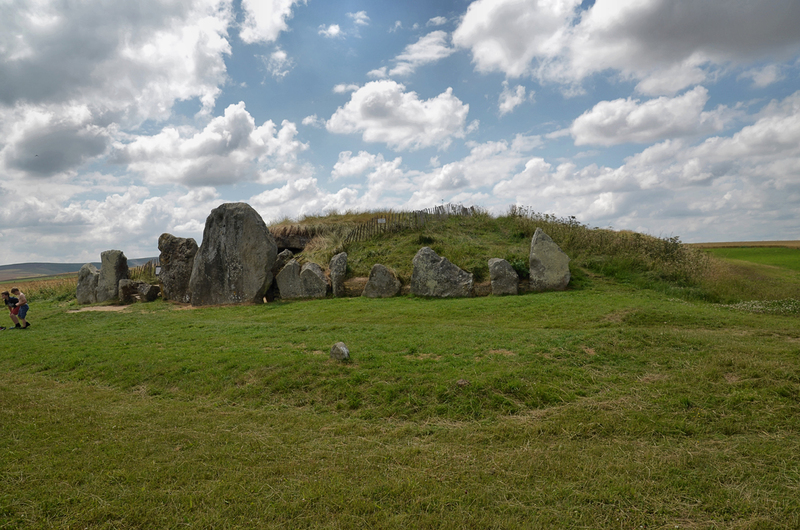 Oolithic limestone was brought over 25 miles from the Frome area of Somerset to build these stone burial chambers located at one end of one of the largest barrows in Britain (about 100 metres). It was probably in use from 3650 BC for a thousand years. Excavations have found 46 burials there, men and women, old and young, and all died within about 30 years of each other. Finds from the site, including evidence of the later Beaker people, are on display at Wiltshire Museum in Devizes. There have been many theories about this site and its relationship to the rest of the Avebury complex. Stukely’s research led everyone down the Druidic theory and William Blake followed in his ‘Jerusalem’ book supposing a Serpent Temple pattern. Geoffrey Ashe points out in ‘Mythology of the British Isles’ (Methuen 1990) that this theory has its place in modern myth-making as part of general claims about an ancient religion probably dominated by the Mother principle or a Great Goddess. Robert Graves also supported this idea of a goddess orientation. East Kennet is completely different from West Kennet and is quite inaccessible and large. It is the largest longbarrow in Britain and its atmosphere somehow protects it from too much exploration.